What is the Early Permanence Quality Mark? The Early Permanence Quality Mark is the standard of excellence awarded to adoption agencies that demonstrate the quality of their service, and their commitment to delivering early permanence for children where adoption is in their best interest. 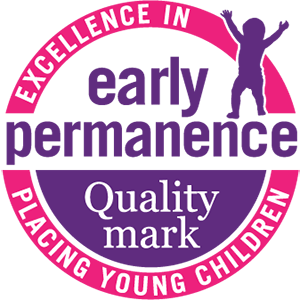 The Quality Mark is a sector owned and defined award, which supports excellence in placing young children. It gives adoption agencies the opportunity to innovate and improve agency and regional delivery. Being awarded the Early Permanence Quality Mark is validation that you are working according to sector best practice and will position your agency at the forefront of early permanence. Identifying areas of improvement, which can help agencies develop longer-term strategies and sustainability. Read more about the benefits for your agency, download the Quality Mark flyer (pdf). All applications go through a qualitative moderation process by a panel of independent experts, where agencies are assessed against a set of sector-informed descriptors and guiding principles. The aim of the process is to provide quality feedback to agencies and to encourage positive change, in order to drive forward sector best practice in early permanence. Read more about the Early Permanence Quality Mark in our FAQs section. There are two levels of accreditation to the Early Permanence Quality Mark: Full and Working Towards. Read our Useful Tips on applying for the Quality Mark. A service action plan and supporting documentation, with reference to key elements of the Quality Mark Descriptors, will be required as evidence for recognition of Working Towards Early Permanence status. Applications for Working Towards recognition will be viewed by an Independent Moderator. Agencies who gain the Working Towards recognition are supplied with the ‘Working Towards’ logo, to signify sufficiency in working towards early permanence. The agency and partners to any application must consider whether they would first benefit from applying for the Working Towards status, or whether they immediately proceed to a full award application. Read our Useful Tips on applying for the Quality Mark. Applications for the Quality Mark are submitted online, via a step-by-step application process. The first step is to Register to apply. Application fees, to cover costs, are £750 for a Full application and £400 for a Working Towards application. Click here for full fee scale. Coram has published two papers, on early stage consultation with LAs and VAAs on early permanence and the state of play. We welcome applications to the EP Quality Mark. To assist agencies plan we have set aside quarterly dates for receipt of applications and for the independent moderation panel to consider submissions within two weeks of the receipt date. Get started now – you can update your application content progressively before you are ready to submit the application in full.